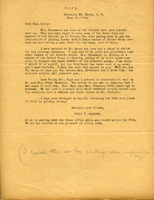 A letter telling Martha Berry that Mrs. Shoemaker and her friends are willing to host some of the Berry boys and members of faculty to go to a camp that Oxford is having in Pocono, PA for 10 days. 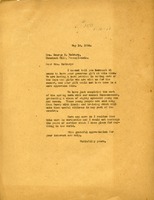 This is a letter from Miss Berry to Mrs. McCrary thanking her for her donation of 150 dollars. Miss Berry expresses the hard times she is going through with funding, but says she would never regret her years put into the Berry Schools. Thank you letter to the Shikelimo, Thomas Leiper, and the Valley Forge Chapters. 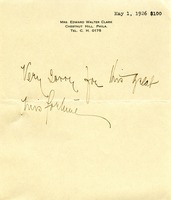 Mrs. Edward Walter Clark writes a note saying "Very sorry for this great misfortune" and included in the note is "$100" typed at the top.